I’m holding these Rubik’s cubes for a couple reasons. Number one, I wanted to get your attention about the fascination around a Rubik’s cube, and I also think what we’re going to talk about in our episode has to do with everything related to your business and tying in this Rubik’s cube. Thanks for making us part of your day. If you want to get in on the conversation, you can join thousands and thousands of others on Twitter at @Dan_Kuschell. In addition, if you want to come back to this episode, which is probably going to be a great idea, you can do that at GrowthToFreedom.com/167. If you never want to miss an episode, check this out right now, right here. Do you realize that we literally have over 150 hours of some of the best wisdom, strategies, and insights to help you get more clients, grow your business, get more sales so you can have a bigger impact, reach, and contribution? If you never want to miss an episode, not only to access to all the past easily on iTunes or other platforms or get all the future episodes as they come out live, you can do that at GrowthToFreedom.com/Subscribe. I can relate. Truth be told, years ago, I got fascinated by the idea of working with some people today called digital marketing. I look at it as marketing and doing it online, and it’s just one vehicle. It’s not the only vehicle. It’s just one vehicle, and I got fascinated by it. This is about fifteen, eighteen years ago and I started taking the time to learn some of the things that make it work. It’s an incredible platform if you know how to use it. Like the Rubik’s cube, it only has about eighteen to twenty combinations that matter, I’m here to share it with you. Our session is about one of those ideas that matter, and we’re calling this session the Seven-Figure Breakthrough. Would you like to have your seven-figure breakthrough? 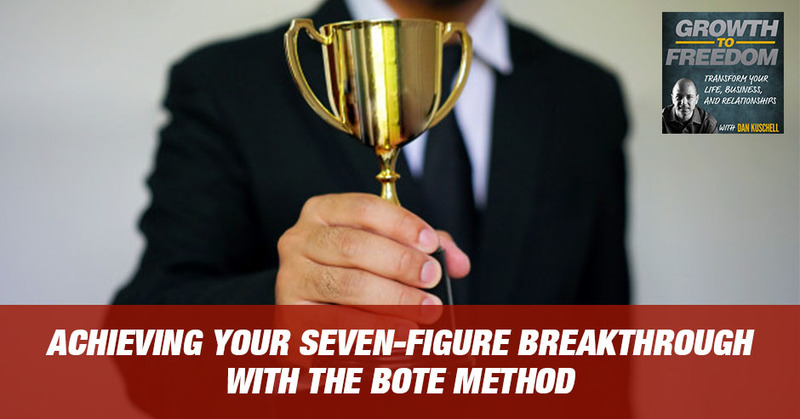 We’re going to talk about one of the ways to be able to do that is what’s called the BOTE Method. For you to get more clients, make more money and stand out in the crowd. Imagine it, picture this. Picture you positioned as the definitive choice in your marketplace. You are positioned as the absolute, not only one of the top, but you’re the most unique at what you do and how you do what it is you do. You’re the one who gets paid the most. What we find is a few critical areas, getting more clients in a predictable automated way. “The sales in my business, the growth of my business is solely predicated on my own efforts. It’s on my hustle, my charm, and my ability to go out and network. I’m traveling all over and I’ve got no bandwidth and I’m wearing twelve hats.” Have you ever felt like that? If you’ve ever felt like this, then our session, the Seven-Figure Breakthrough, the BOTE Method for you to get more clients, make more money and stand out in the crowd, is something you’re going to not want to miss. You want to grab a pen and you’re going to want to grab a piece of paper. Imagine, what would happen for you being positioned as the definitive expert, premium products, premium services, premium pricing, being able to get paid more for what it is that you do, and not having to go after clients because you need the money, but because they’re a right fit. That’s what the BOTE Method can do for you. There are three pillars to the BOTE Method. If you think of the BOTE Method, one way to look at it is a Parthenon structure where you’ve got the big roof at the top and you’ve got three Parthenon pillars supporting it. Another way, my business partner, Jimmy Harding, calls this The Triangle of Transformation. However you see things or however you like to visualize things, let me get started with the BOTE piece. You’re going to want to write that down. What business are you in? You’re not in the business you think you’re in. You’re not in the product business. You’re not even in the service business. You’re in the business of BOTE. What his BOTE? BOTE is really simple. When your clients come to you, what are they looking for? Are they looking for the glop that you offer or the service that you offer? Probably not. They’re looking for something more, and what does that give them, and what does that mean for them? What will it do for them? I’ll sum it up in this BOTE acronym. They’re looking for a Breakthrough from you. They’re looking for an Outcome from you, they’re looking for a Transformation from you, and they’re looking for an Experience from you. BOTE Method: When your clients come to you, what are they looking for? Their messaging was certainly better than that, but at the end of the day, what did they do? They had 50,000 people sign up to get access to the first car. Then they did it again with a lower level car, and I believe they’ve had over 150,000 people sign up and put a deposit down. The numbers could be updated now. Those might be a little bit inaccurate or revisionist history, but they did that. They created a breakthrough, outcome, transformational experience. It wasn’t a car they were giving people. It was the breakthrough and experience. What could you do to create and communicate and articulate and work with your messaging that you’re focused on helping your clients get a breakthrough, an outcome, transformation, and experience? What would it do for your business? 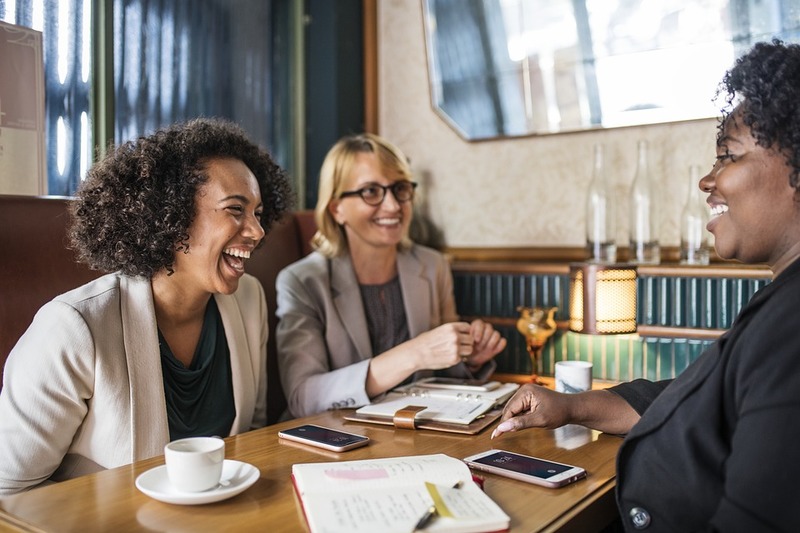 If you could help your clients connect at a deep level, like the breakthrough, the outcome, the transformation and experience connects to the emotional needs, like what Tony Robbins refers his Six Human Needs which are certainty. That’s one of the most underutilized, emotional focus is in messaging in business now, certainty. There are a lot of different frameworks around certainty like security and confidence and clarity, but certainty being a focal point. Uncertainty. You usually aren’t going to walk up to somebody and go, “I’d like to offer you some uncertainty.” No. There’s a different way to say that. It’s adventure. It’s fun. It’s freedom. Would some of your clients, regardless of what you saw, like to have more fun, like to have more freedom, like to have a breakthrough, like to have a better experience? Think about what that would be in an adventurous, fun freeway? I’m simplifying some of this certainty, uncertainty, there’s love. At the end of the day, most of us are searching for love. Most people, as the old saying goes, “We’re searching for love in all the wrong places.” People buy cars and they buy jewelry and they buy big giant homes. Why? They are trying to fill a need of love or connection or bonding. What could you do to offer that transformation outcome in your business? How about being significant? We all want to have significance. Daniel Pink and one of his great works identify three main things that people want. Autonomy is one of them, which by the way is a part of uncertainty, which is freedom. He also talked about the idea and all the data that he did with tens of thousands of people apparently. One of the other factors is the ability to have meaning in what we do, meaning and purpose. You probably want that too, don’t you? What if you got very clear on focusing on how to communicate your breakthrough, outcome, transformation, and experience in terms of being able to get more significance in their life, more meaning, more purpose? It’s a conscious choice that you make. It’s also a conscious choice to not do this. It’s probably costing you money, but when you get this right, I can tell you what happens, a seven-figure breakthrough. There’s certainty, uncertainty, significance, love, then there’s growth and then there’s the deepest level of contribution. What would happen if you could compel your clients to want to work with you like a magnet and be able to focus on giving them the ability to feel like they’re contributing at a big, big level? I’ve been very fortunate. I’ve found that the smartest entrepreneurs, the highest level entrepreneurs, achievers, they’re the ones going out and they want to make a bigger contribution. If you want to make a bigger contribution, I’m going to challenge you to focus on how do you create the BOTE with your client base. Whatever product you sell, whatever service you sell, especially if you’re a coach, consultant, an influencer or a service provider. How do you help them see the breakthrough, the outcome, the transformation, and the experience? You know what happens? 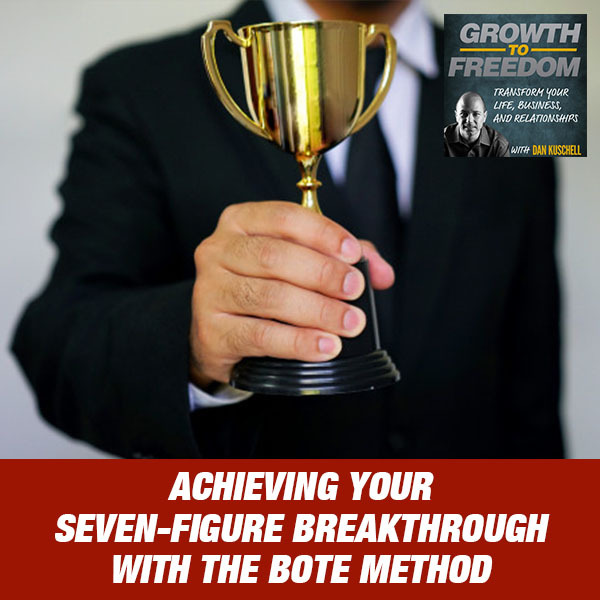 You get your seven-figure breakthrough because you’ll start to attract clients, make more money and stand out in the crowd. One of the highest level leaders have a large mastermind group had contacted me. We’ve gotten together a handful of years ago and I remember having a conversation with him about some certain things and he shared a lot of the similar frustrations. “I feel like a lot of this is built on me. My schedule is so full. I’d love nothing more than to double or triple this,” and the long and the short of it is I went in and helped do that and we tripled the company’s sales and grew the profits by nineteen times. Today, he gets to spend his time focused not just on his business and he spends a lot more time today on it than in it and doing more of the things that are in his sweet spot or his genius, but on top of that, he gets to work and contribute to incredibly meaningful work and meaningful projects that mean something to him and his organization. Think about the freedom that that would give you to do. BOTE Method: When you’re communicating what it is that you provide and offer, it’s around the idea or concept of strategy. Coming back, I’m holding the Rubik’s cube. There are 43 quintillion possibilities and literally you can make eighteen to twenty moves that matter. The same thing is in business. There are eighteen to twenty moves. This is one of those types of moves that can really transform your business for you to get your seven-figure breakthrough. What is the first pillar in the BOTE Method? The first pillar is when you’re communicating what it is that you provide and offer, it’s around the idea or concept of strategy. This shows up in a few different ways. 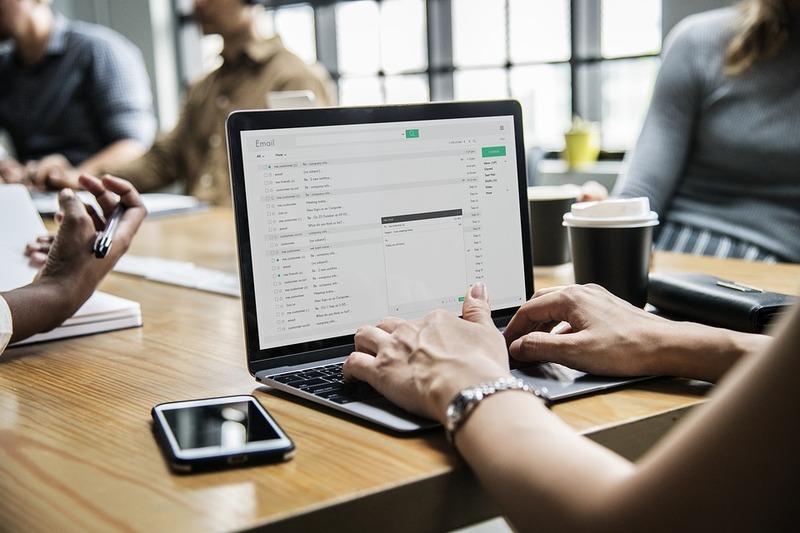 Imagine if we work together, you’re going to get the strategy, you’re going to get templates, you’re going to get tools, and you’re going to get the systems to help put an automated method in place to get more clients, to get a predictable flow of leads, to get a predictable method to generate leads when you’re not working. By the way, stepping out of what that pillar is, the person I was mentioning, when I had met him a few years back, most of the sales in his business were based on his efforts personally. He’s amazing. He’s awesome and he had a very successful company, immensely successful regardless of whether we ever teamed up, but when we teamed up, I saw a lot of assets not being utilized that could be utilized, so we put an automated system in place. We put a predictable system in place. Now, he went from the year before I got there, there were 37 people who were applicants or candidates for one of the major programs that he offers. Today, he gets over 1,100 applicants a year. You want to understand what happens with hockey stick growth, it’s putting a system in place. I’ve left him with the tools, the strategies, the pieces to go with it so it’s sustainable and that’s one of the pillars, strategy. The second pillar is conveying the idea that you’re not doing this on your own. The lowest level of learning today is on your own. There are some people who just opt for it and part of it is because of affordability for people, but what is it costing you trying to become the expert? Seth Godin talks about the 10,000-hour rule. You can go through the entire learning process of 10,000 hours to have an expertise in something, or you can hire that capability for a fraction of what it would cost to go through 10,000 hours. What’s your time worth? Even if you’re worth $20 an hour or $10,000 hour, that’s a lot of money, isn’t it? You’re going to pay far less than that to acquire an expert’s talents and capabilities. When you’re conveying what you do, your breakthrough, your outcome, your transformation experience, one of the keys to convey and the messaging is how you can work side-by-side with it. Chances are, a done-for-you model may be a little bit too high end, although it could be possible, but working side-by-side where you even just say, “It’s like working with us side-by-side. We’re going to look over your shoulder. It’s going to be done with you. We’re going to be a guide from the side. We’re not a sage from the stage. We want you to be independent.” I know that’s a core value in our company. One of the interesting, fascinating things I see in our industry in the coaching, consulting world, the influencers, and service professionals, a lot of these experts out there, they want you to depended on. I get it because what it does, it creates pain to disconnect. It creates cell phone stick rate. What my belief though is the exact opposite of what 99% of those experts do. I want to leave you independent of needing me, which creates more value. This client I was mentioning just texted me with something, which is amazing to still maintain those great quality, high quality relationships even when you’re not working together in that capacity anymore. The key is how can you convey the side-by-side methodology, done-with-you methodology? The guide, the mentor? How can you put yourself in a position to convey that in what it is that you do? Take action with what you’ve gotten. The third pillar is one that’s often overlooked, but probably I would say the most important, and that’s the mindset piece. It’s the psychology. We’ve had Dr. Cristy Lopez on the show for years, and there’s a big reason. It’s because I believe so much in the idea of the mindset and psychology that she’s a definitive expert at this and it makes sense to include it. What could you do in the delivery of your breakthrough, outcome, transformation, experience, to focus on the mindset and the psychology, to help your tribe, to help your community, to help your client base become warriors, their best selves so they had a bigger future? Imagine what that would do? That they’re a champion, that they get breakthroughs and they experienced that with you, even if your product or service has nothing to do with mindset and psychology. I’m not saying spend 80%, 90% of it, it’s a small piece of the pie. Just to recap, we’ve talked about the BOTE Method, Breakthroughs, Outcomes, Transformation Experience to create high affinity to what it is that you do and focus on what it is you do and how to communicate it using the three pillars of systems side-by-side, the guide and the mindset. What would happen for you and your business if you put this in place five years ago? Where would you be today? Would you be further ahead and focused on this for you and your business and your clients, or would you be further behind? My belief is you’d be immensely further ahead because I’ve seen it with thousands of companies who are using this type of strategy. Here’s the deal, we can’t do anything about the last five years. We can certainly do something about the next five. I encourage you to take action with what you’ve gotten. If you want to come back to this episode, you can do that at GrowthToFreedom.com/167. Never miss an episode. You can do that at GrowthToFreedom.com/Subscribe. You might be saying, “Dan, what if I want to go deeper with you guys?” I’d encourage you, we’ve got on-demand training available that will then give you the ability to schedule your Breakthrough Activator Session and Breakthrough Activator Call. You can go and learn more about what we’re up to with our on-demand training and that session for us to spend that time together. You can do that at ChampionBusinessBlueprint.com. Thank you for being a part of our show. Take action with what you’ve been given. I will see you next time on GrowthToFreedom.com, make it a great day.